This wide field image contains three interesting targets. 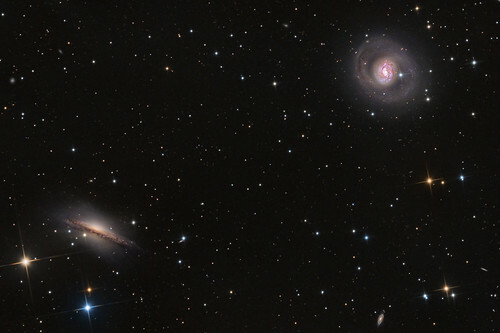 The first two are the larger galaxies in the foreground, NGC 1055 (lower left), and NGC 1068 or Messier 77 (upper right). The third is a little harder to spot. Zoom in on the galaxy in the upper right. If you are familiar with M77, there is what appears to be a little star where no star was before. It’s near the core, at the six o’clock position. That new star like object is Supernova SN 2018ivc. If you are having difficulty spotting it, I constructed an animated gif that highlights the event. Click on the image to zoom in. https://www.astrobin...379580/?nc=user and you will see it blinking in the animation. The galaxy in the lower left is NGC 1055. This is an edge-on spiral galaxy located in the same constellation, Cetus. It has a prominent bulge crossed by a wide knotty dark dust lane. If you look carefully, several bright Ha areas can be easily seen. NGC 155 is 52 million light years away, and has a diameter of about 115,800 light years across. The apparent size is 7.6 X 2.7 arc min with an apparent magnitude of 11.4. It’s a fairly dramatic look galaxy, and the glow around it is just amazing. I really like the look of this galaxy. Messier 77 and NGC 1044 are a binary system. Because of this, I really wanted to include both objects in the same frame. Normally, I would image each separately. This is way better than the APOD image of this same scene from yesterday. Amazing that you caught a SUPERNOVA !!! I wish I could take an image like this, but I think all I will be able to do is some planetary style DSO imaging ...we'll see. Every now and then you get lucky. Thanks for the nice feedback. Wow that is a very nice feedback. Go for it. Grab some photons. After all, they have been travelling a very long time not to be used. Great work on both galaxies, Terry. A science question about the SN: is this on the faint side for an SN? I don't track these down so I don't have any experience on this, but I'm used to the idea that SNs are often as bright as the galaxy itself. Hi Kevin. Thanks on your great comment. Well, when you put it all in perspective, you have to take into account that the light is coming from a single source some 47 million light years away. There is no way that my instrument (a modest 10 inches) could see a single star at that distance. The before and after shots of the supernova are very different, with the resulting supernova looking like a star imaged in our own galaxy. This is an incredible amount of energy being emitted from a single source. If the event where further away from the core of the galaxy which has perhaps billions of suns, visually it would be a lot easier to spot and appear to be more dramatic. There are individuals that have seen this visually and that very impressive given the distance. I hope this helps.